Often times, necessity is the mother of invention. Many products are conceived out of necessity, while there are products which occur from what may seem like serendipity. With the prevalence and popularity of 3D printing among a variety of users, from elementary students to precision machine shops, the ability to develop products is becoming a more appealing and accessible process. But how does what starts as a design concept make it to the finish line as a final product? After all, an idea is only as good as its execution. Q-PLUS Labs uses 3D scanning to help with this process for the founder of GQ Moto Inc., who intends to show the story of an invention's journey, from idea to production. George Parstch, a pre-med student and business student turned inventor and patent holder is familiar with the dilemma of having an idea and figuring out how to execute on it. He's encountered this scenario quite a few times in his career – at least eight, to be exact. Most of these ideas came from his experience in a wide variety of fields from personal stylist and wardrobe consultant to medical device engineer. Parstch envisions bringing eight unique products to market while showing people how they can do it too through video documentary of his design's journey through development to delivery of the finished product. Parstch approached Q-PLUS Labs seeking 3D scanning expertise for reverse engineering some of the prototypes he's developing. 3D scanning provides two main benefits for product development. One is reverse engineering which allows you to obtain the exact dimensions of an object so you can replicate it or in this case, improve upon it. The second benefit that 3D scanning provides for product development is dimensional inspection which aids in comparing the actual condition of a manufactured part or component to the nominal condition as defined by engineering drawings and blueprints, metal or film templates (decreasingly), digital files and 3D CAD models (increasingly), or even a master tool or part. With a step by step documentary on how to bring new products from concept to completion, Partsch seeks to creatively innovate products used on a daily basis from menswear to children’s sports equipment. His background in medical device design, also has enabled him to develop a device that is more custom fit and functionally appealing to the user or consumer than what is currently available on the market. 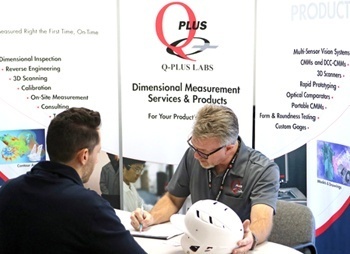 Q-PLUS Labs’ 3D scanning expertise enables companies like GQ Moto Inc. to get what they need for their design concept or refining their finished product. If you’d like more information about how we can use 3D scanning services as well as a wide variety of dimensional measurement services to help with your current idea or manufacturing process, click here to schedule an assessment.